Close your eyes. How do you imagine the typical launch of a new car brand? Maybe the Freds-in-sheds approach? You know, the low-volume British sports car Next Big Thing, dreaming of nibbling into Porsche's market dominance from a lock-up in the Home Counties? Or at the other end of the spectrum, perhaps the blue-chip financial muscle that begat Lexus and Infiniti, DS and Cupra – all big budgets, industrial might and spreadsheets, marketing reason occasionally trumping genuine customer need? To that list you can now add a third option: the electric car start-up. For we are entering a new age of opportunity and disruption, as think-big entrepreneurs eye up the fledgling EV marketplace, estimated to balloon to 125 million units by 2030 according to the International Energy Agency. This explains why Volvo has spun off Polestar into a standalone electrified brand to chase Tesla, and why the list of smaller specialists is swelling each year as new names such as Lucid Motors, Faraday Future, Byton and Nio charge in to keep the authors of the I-Spy book on car badges busy. 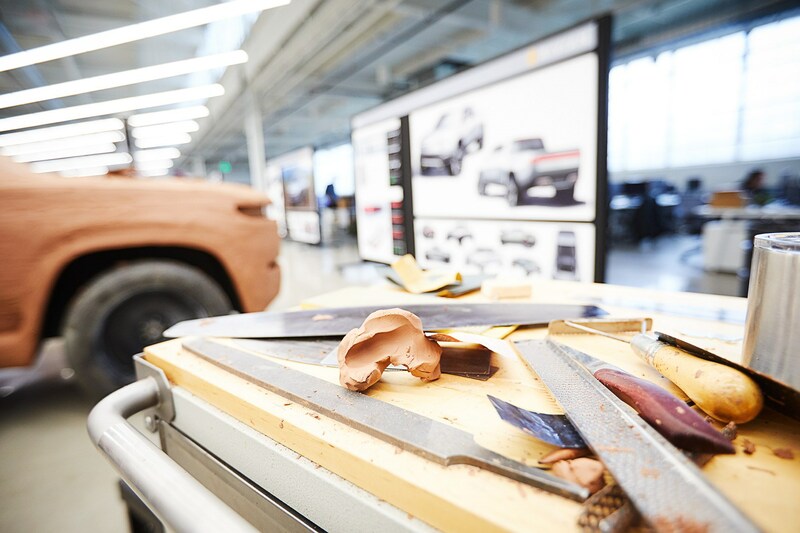 Which is how CAR finds itself deep inside Rivian headquarters in Plymouth, Michigan. It's another new name among dozens of start-ups, but one whose chances we rate higher than most. They're adamant they're not a start-up; the company's roots can be traced back to 2009 and it's now in the 'scale-up' phase, as it prepares to launch the two electric cars that shocked visitors to last autumn's Los Angeles auto show. 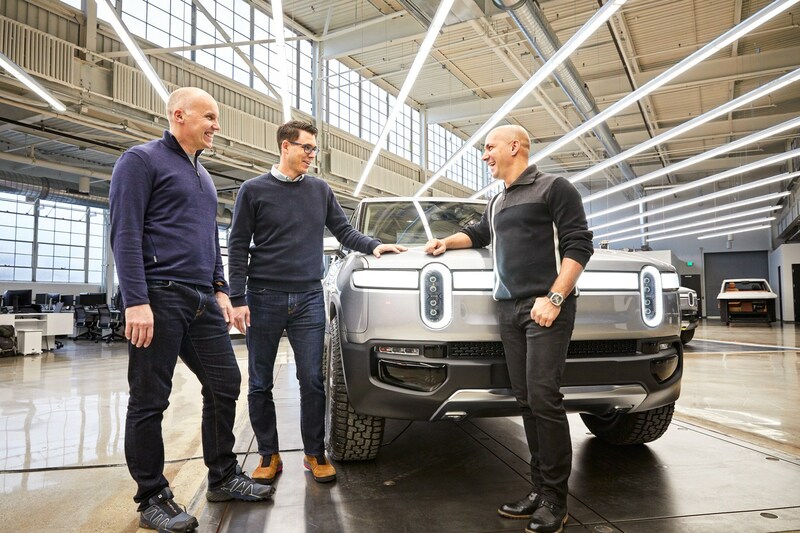 The company agreed to open its doors to CAR so we could see and hear for ourselves why they're confident Rivian will win where others will wither. Even the biggest upstart the automotive industry has perhaps ever witnessed – Tesla – is finding it tough; Elon Musk recently had to axe seven per cent of his workforce, making thousands redundant as he struggles to ramp up production of his innovative electric vehicles. to beaches, parks and forests of a weekend should be silent and zero-emissions too? Yet nobody is focusing on this niche today. It feels like uncharted territory in the automotive firmament. 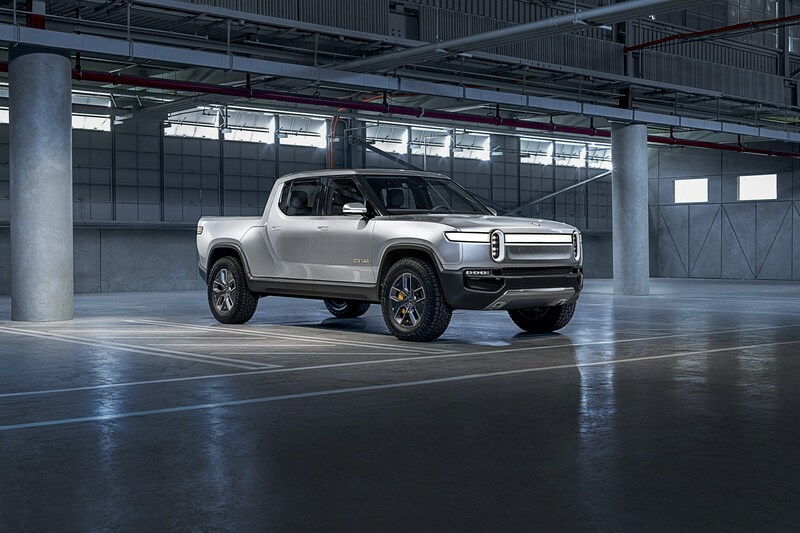 Enter the Rivian R1S (S for SUV) and R1T pick-up (T for truck), the fully electric duo unveiled in November to much fanfare. These bold EVs are production-ready, share an identical e-powertrain and are bristling with eye-grabbing details: an electric range of up to 400 miles, neck-snapping acceleration (0-60mph dispatched in a Ferrari-troubling 3.0sec) and the ability to drive anywhere (even wading through 1m of water and up 45º inclines) with seating for seven in the SUV. 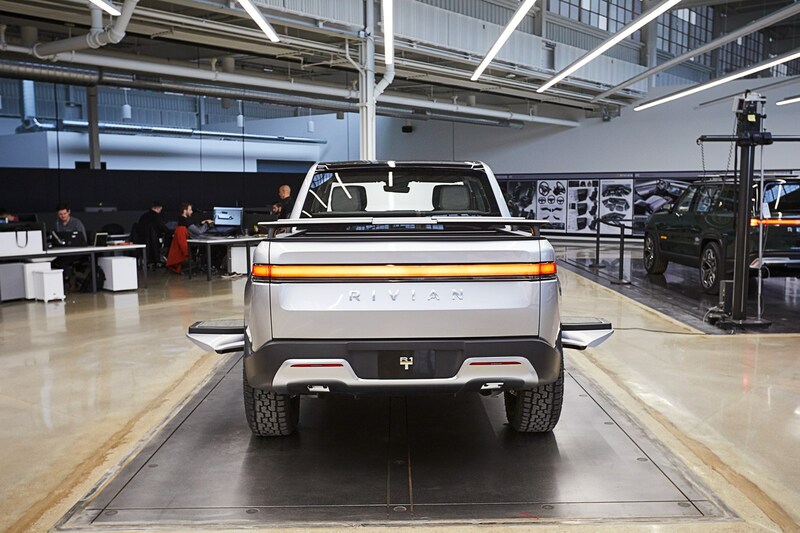 Spy either Rivian for the first time and they appear large to European eyes (both are more than 5m long), but in fact their footprint has been carefully corralled around benchmark vehicles. First up in late 2020 is the R1T, whose dimensions closely mirror those of the Chevy Colorado; it's a whisker smaller than the bestselling Ford F-150 pick-up. Its loadbed can swallow 800kg of clobber (under the UK's one-tonne tax threshold, disappointingly) while the towing capacity is an extraordinary five tonnes, but it's the think-different detailing that'll hook you in: the flat electric skateboard platform frees up space for the novel Gear Tunnel under the rear seats that's big enough to swallow a surfboard; the distinctive 'stadium' headlamps and horizontal light bar that pulses as you charge, indicating battery level; and the development of tents and mobile kitchens that fit on the loadbed to fulfil the outdoor adventure promise. 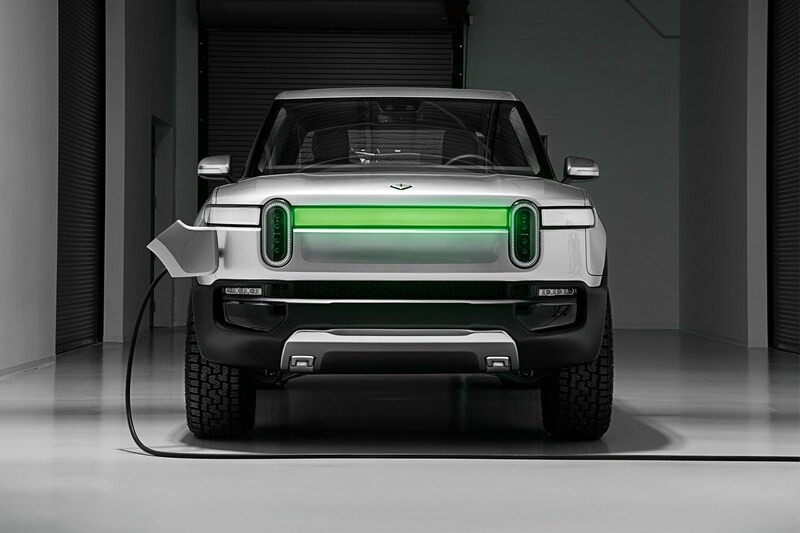 Rivian has beaten all-comers to market with this electric pick-up. While Musk's got his hands full developing Model 3s, Roadsters and lorries, colonising Mars and revolutionising underground transport – not to mention signing all those P45s – Scaringe has snuck in before the big guys, sexing up the utility sector with zeitgeisty electric shocks. Being nimble is important here: hometown rival Ford has only just committed to launching a hybrid F-150 next year and the emergence of Rivian on its doorstep is plausibly one reason why the Blue Oval is joining forces with VW to accelerate electrification of its own trucks and vans. If Rivian can execute its plan on schedule, it will have beaten the world's biggest car manufacturers to market by years. Today it employs nearly 700 people – this is no mere fly-by-night back-room start-up. 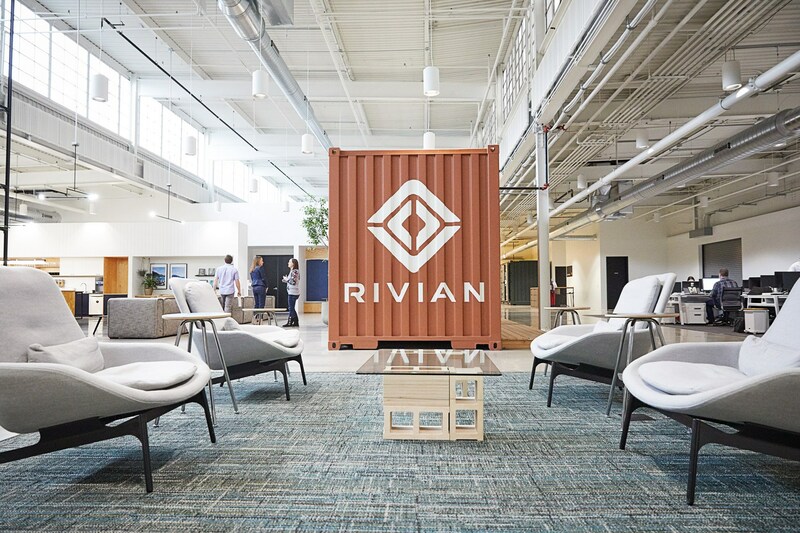 Rivian is expanding fast with headquarters in Michigan, R&D bases in California and Surrey, and (crucially) a 2.6m sq ft former Mitsubishi factory in Normal, Illinois, with the potential capacity to produce up to 300,000 vehicles a year (although Rivian is talking more modestly of 50,000 of this launch duo by the middle of next decade). Despite having not delivered a single vehicle to customers, this is already becoming a sizeable business that's attracting investment from finance houses in America and the Middle East. Those deep pockets have enabled Rivian to poach some top talent to join the fledgling car maker. Executives have been headhunted from existing manufacturers, such as Brit Mark Vinnels, the executive director of engineering who worked in a similar capacity at McLaren in the ramp-up years, marshalling the MP4-12C from genesis to launch, and then refining it into the super-successful 650S and 720S and their numerous progeny. 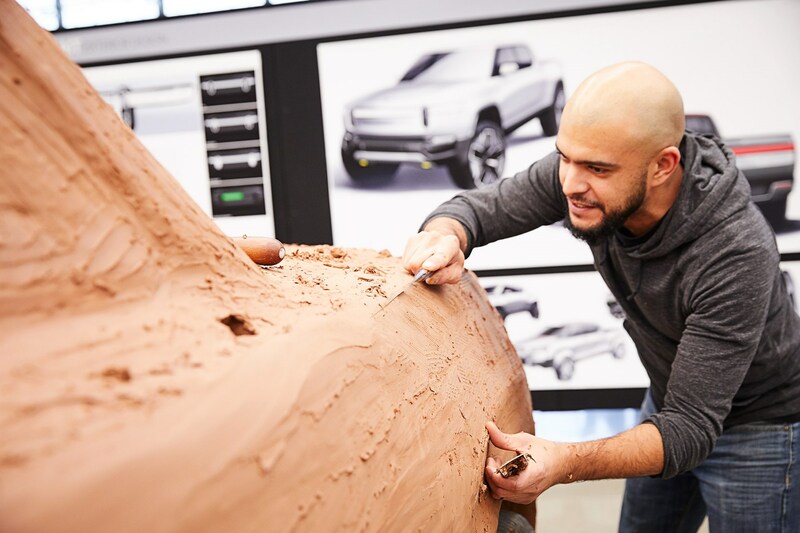 Scaringe identified that clean-sheet engineering process in Woking and the luxury supercar chassis set-up as compelling experience from which Rivian could learn. 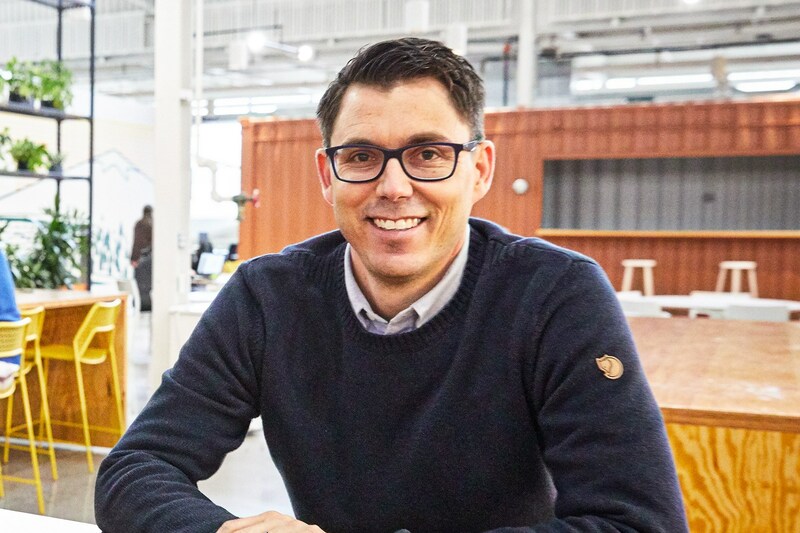 Vinnels has obsessed over the skateboard backbone of the Rivian range and relished the new-from-the-ground-up design. The platform is devilishly simple, with the battery packs mounted low to boost handling and sealed to keep them waterproof. The Rivian duo are pitched to compete off-road with Jeep or Land Rover – they'll ford a deeper stream than a Range Rover and even spin on the spot with a special tank-turn mode, thanks to individual electric motors at each corner. They believe prospective customers will want to take their cars off road, not just know that they could. EV range remains a major stumbling block for drivers coming out of combustion engines, so there'll be a choice of three generous power packs from launch: even the smallest 105kWh battery is rangier than Tesla's biggest today, and 180kWh is available at the top end if you've got the budget. The cheapest R1T will cost a little more than $60,000 in the States after incentives (£46k at today's exchange rate, though sterling prices will doubtless creep upwards), while the long-range version will exceed $100k (£76k). The onboard charging system can accept up to 160kW, bringing the potential to rapid-charge even the biggest battery in a little over an hour if you can find a suitably high-power DC charger; plug in at home on AC and an 11kW onboard charger will top up the vehicle overnight. It all sounds terrifically advanced. Can a new player really nail this stuff first time? There are certainly numerous hurdles to overcome, but Scaringe's team believes the rules are different in this electric era. Remember the reaction to the box-fresh 2012 Tesla Model S that caught the premium set napping? Rivian's exhaustive durability programme is underway right now, testing how the EVs perform in the wintry chill of Minnesota as well as the bake of Arizona. Vinnels draws a diagram positioning Rivian products somewhere between the gung-ho toughness of a Subaru, the eco credibility of a Tesla and the family practicality and off-roading skills of a Discovery. 'We're using air springs and hydraulic roll control, so we can change the roll stiffness,' engineering chief Vinnels explains. 'We can have rigidity for high-speed handling and our benchmark on road is a Cayenne Turbo. But we can also change the spring rate at the rear to cope with a heavy load. We are aiming for Audi Q7 levels of NVH [noise, vibration and harshness].' Suspension is by double wishbones up front and a multi-link rear, controlled by adaptive dampers. Clamber onboard either Rivian and you'll find pared-back, surprisingly simple interiors. These are cars designed to get mucky and it's hard not to fall for the practical, brush-out floors and eco materials chosen for durability and sustainability. Vinnels says half the engineering team are electronics specialists developing the infotainment, which seems to double up as a CRM system taking care of ownership issues and over-the-air updates. Drivers operate slick twin touchscreens of 11.8 and 15.6 inches in diameter to control most minor functions, flicking and swiping with smartphone ease. If you're still wedded to physical buttons, you might prefer to shop elsewhere. Clever details abound. On the seatbacks are slender aluminium coat hooks; tip them forward, and a pair of USB charging points are revealed, letting kids in the back charge up gadgetry on the fly. The Gear Tunnel on the pick-up truck is truly vast at 350 litres and the frunk is three times the size of a Tesla's, easily swallowing big bags. They've obsessed over the practicalities of everyday life. That floor carpet material is so dirt-resistant, design chief Jeff Hammoud claims, that it didn't even need hoovering during a fortnight of intense trample at the LA auto show. Perhaps Rivian's cleverest achievement is that 91 per cent of components are shared between the R1T and R1S, the follow-up SUV due in early 2021 with five or seven seats. The company intends to license its electric skateboard architecture to third parties and the founder tells CAR that he's already speaking to numerous established car makers about selling the platform to shortcut their own EV development (Pininfarina is rumoured to be one client). Intriguingly, they're also negotiating with non-automotive brands. Nike electric car, anyone? 'We have shorter versions of the skateboard coming too,' Scaringe admits, revealing that more compact R2 models will come in the second wave after 2022. Trademarks for R1A, R1C, R2A, R2C, R2R and R2S have been filed, suggesting coupes and other bodystyles. That R2R is a rally-raid car in the works, perhaps reflecting the boss's love of Porsche sports cars (he used to do up old 356s for a hobby). 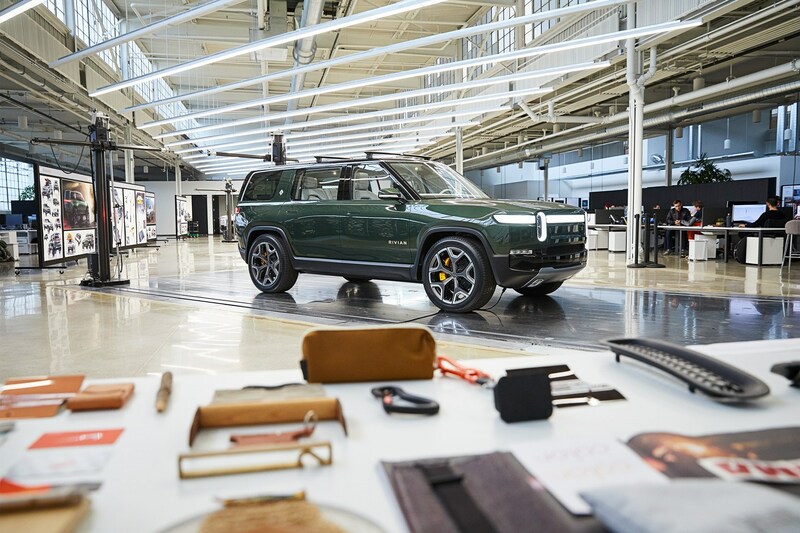 'There are six Rivian versions in total planned at this stage,' he says with remarkable candour. Throughout our interview, the boss never flinches from any question and his lack of obfuscation is a breath of fresh air. But then that's precisely what the new generation of EV challenger brands stand for. Rivian and others are blowing into the motor industry like a hurricane, knocking over received wisdoms left, right and centre. Witness the Hoxton ambience in the Plymouth HQ, replete with break-out areas with racks of plants and cool shipping containers. The fact that each year the entire staff dress up like founder Scaringe on his birthday. That they eschew the tradition of hiring professional event staff at motor shows, instead sending rank-and-file employees to work on the stand, learning from interaction with real customers as they go. If they can pull this one off (and investors are betting hundreds of millions of dollars they will), Rivian really could flood the market with think-different electric cars. There's something about the Rivian vision that feels right for the zeitgeist. The company is named after the Indian River, the estuary that ran through Scaringe's childhood backyard in Florida. It's a fittingly fluid, dynamic badge for a brand that might just reshape the landscape of adventure vehicles for decades to come. We are planning a direct retail model, with our own dealers. At launch you will own your car outright, but relatively quickly we will launch subscription models, fractional ownership, leasing and new ways to consume your Rivian. We recognise that there's a shift in buyer behaviour. Rivian employees dress like me on my birthday. It started when the company was a lot smaller, but it's stuck. Several hundred people came to work dressed like me in January; it was a pretty strange birthday! I don't have a car right now. I had a BMW i3 until recently, which I liked very much. But because I'm constantly travelling, I dip in and out of our benchmark vehicles. We've got a Discovery, a Cayenne Turbo S, a Ford Raptor and Model X on fleet. The Rivian project is not dissimilar to what we did at McLaren: we've developed one platform and intend to spin off several products from the same architecture. Our car has so many clever touches that boost practicality. The 'frunk' is 330 litres (that's three times as big as a Tesla's) and you can stand on the Gear Tunnel's doors when they're open so you can reach up to the roof. We're working with partners on tents and storage racks. The air suspension is the secret to this car's off-road ability. It can raise by 360mm for extreme off-roading. A Range Rover only does 290mm. Rivian's electrical architecture is unique. 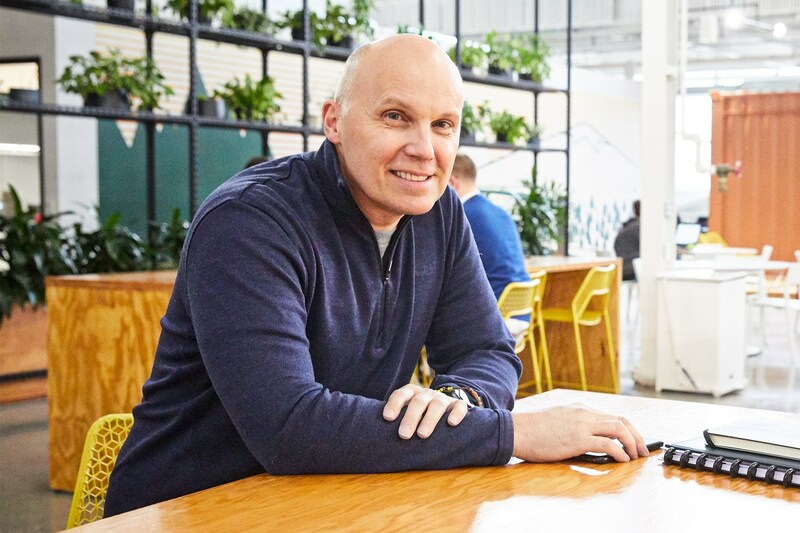 It's not a legacy system – we built the connectivity stack ourselves to get the information on and off the vehicle. It means we'll own the customer experience even 10 or 20 years out. Our skateboard is so versatile. We can go with four, three, two or one motor, but we plan to keep all Rivians as four-wheel-drive models. I was at FCA for 14 years, mainly working on Jeep. It was a good proving ground. Tesla and the German brands tend to occupy the premium space. They're presentational, much like an Armani suit; you don't want to go hiking in it. We see our brand as being more like Patagonia outdoor clothing; we're still premium but we invite you to use it. The main substrate of the floor is SuperFabric – it's the material used on flexible seats and motorcycle jackets. It's very durable and easy to wipe clean. There is so much storage space in the vehicle that if we made the wading depth any greater than a metre, it would start to float like a boat! The 'stadium' headlights give our cars a very recognisable face. We need that as a new brand. 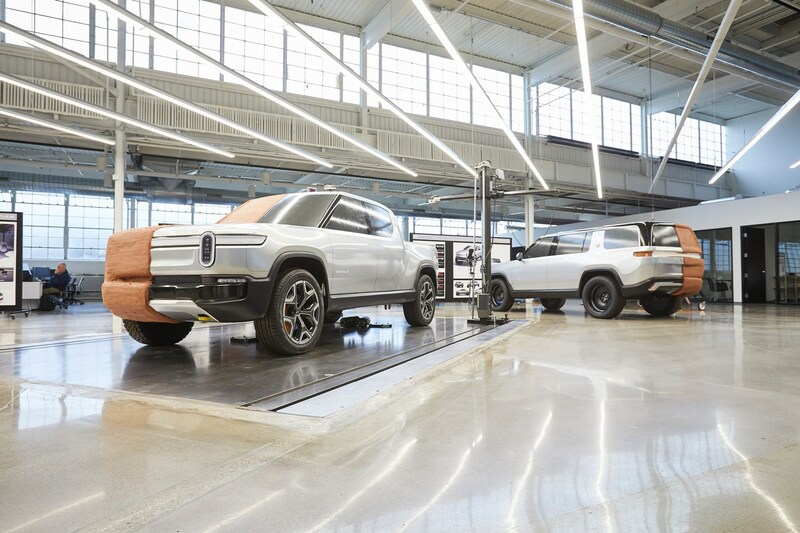 Each brawny motor drives one wheel and torque can be individually meted out across the axle to adjust handling – and even pivot the Rivian on the spot, tank-style. Battery cells are a proprietary design manufactured into Rivian's own module. They're held in a kevlar and carbonfibre cradle integrated into the skateboard chassis. Both Rivians will accelerate faster than most Porsches, but top speed is capped. Expect range to plunge faster than a parachutist in freefall if you drive it like you stole it, though. Special seals and adjustable air suspension lend the Rivian genuine off-road ability to rival a Land Rover. It'll sail past a Tesla Model X, Audi e-Tron or Merc EQ C when the going gets tough. The R1T has been criticised for not having a big enough payload for its flatbed, but Rivian claims its lifestyle audience wants to lug bikes and beach gear, not giant hardware. 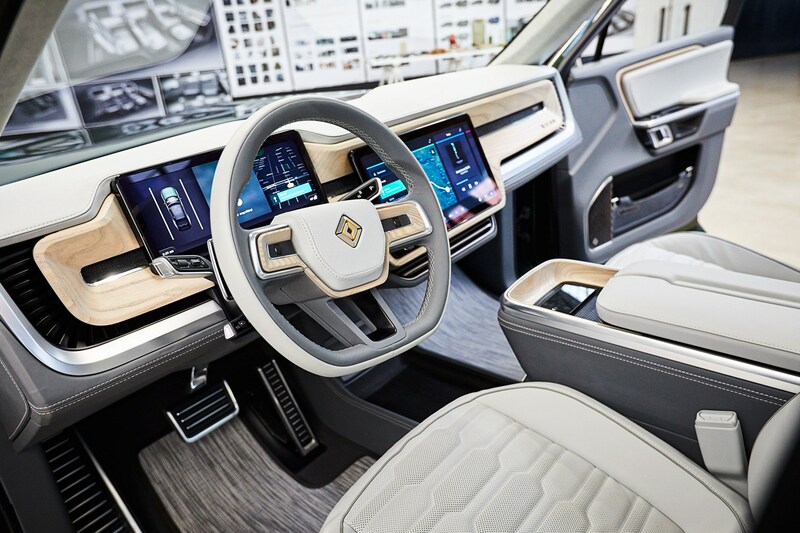 An advanced suite of monitors will enable hands-off Level 3 autonomous driving, Rivian claims. Cameras can also beam terrain footage from front wheels when driving off-road.